A choker is such a type of jewelry – close-fitting necklace, worn high on the neck. The choker necklace may have developed from the fashion of wearing a ribbon around the neck. During the worst excesses of the French Revolution, young ladies in England and elsewhere took to the fashion of wearing red ribbons around their throats. But it was first invented in China and, later on, it expanded throughout the world. The choker necklace was also popular in the Roaring Twenties. Chokers are useful for calling attention to a slim and attractive neck, and perhaps for calling attention away from deficits elsewhere. They can be made of a variety of materials, including velvet, plastic, beads, metal, and leather. It can be made up of gold or a flower. The choker necklace should not be confused with a torque or torc; these metal rings are not completely closed, but are a broken circle which can be bent to open. Torques are typified by heavy metal knobs where the circle is broken, often featuring elaborately incised artwork, which lay upon the collarbone. 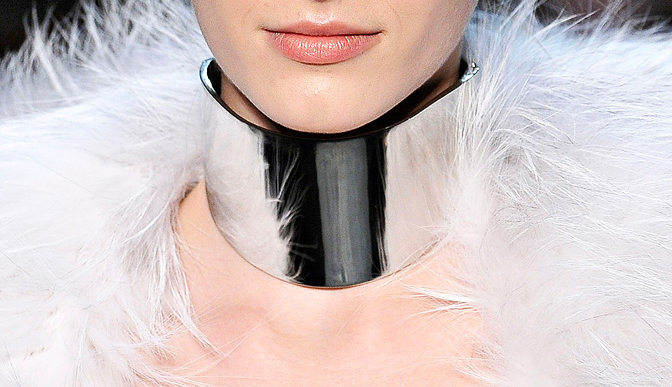 The name choker necklace implies that if it were slightly tighter, it could choke the wearer.